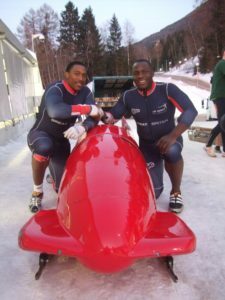 “British Olympic pilot Lamin Deen secured the first major medal of his career with silver in the four-man event at the Bobsleigh World Cup. GB’s Deen, Ben Simons, Toby Olubi and Andrew Matthews led the standings after setting a track record of 50.66 seconds in their opening run in Whistler. This latest podium finish equals the best result for a British team since Sochi 2014 Olympic pilot John Jackson’s second place at the Lake Placid World Cup event four years ago. “It’s fantastic and the morale of the team is so high after a very, very difficult summer, never underestimate the athletes,” Deen told BBC Sport. Britain’s last World Cup victory came in 1993 when Mark Tout drove his four-man team to gold in Cortina, Italy. With the North American leg of the World Cup now complete the athletes will reconvene for the European leg starting on 8 December in Winterberg, Germany.